The Daily Clog » No More Thai Temple Brunch in Berkeley? Anyway, we’ve told you about this place before. What can we say? We love our Thai food. So although being neighbors with a Thai buffet is something close to heaven for us, not all residents are as enthused about the smell of Thai food wafting into their windows in the wee hours of Sunday mornings when they’re trying to sleep. Many neighbors dislike the noise, smells, congestion and trash that Thai brunch brings, and some think the temple is just operating a restaurant under the guise of serving food to their followers. 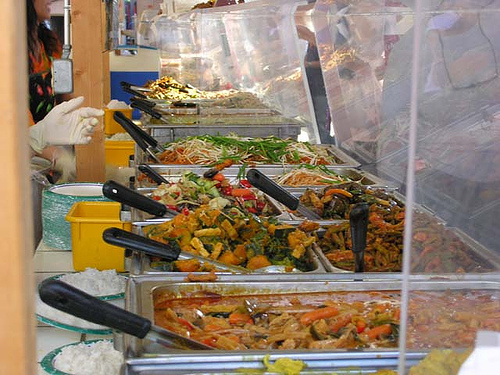 Although Wat Mongkolratanaram serves brunch every Sunday, a permit issued in 1993 limits the temple to only three food-serving events annually, and in June the temple was cited for continuously violating this permit. Yesterday, the temple went to the Berkeley Zoning Adjustments Board meeting to request a use permit modification which will allow the temple to continue its weekly tradition. We hope they were successful, because the thought of no more Sunday Thai brunch is scarier than Sarah Palin not knowing what the Bush Doctrine is. And for those of you who still haven’t gone, get over your separation anxiety from Thai Basil and go while you still can. “Which one? The Bush Doctrine is a journalistic term used to describe some foreign policy principles of United States president George W. Bush, enunciated in the wake of the September 11, 2001 attacks. Scholars identify seven different “Bush Doctrines,” including the notion that states that harbor terrorists should be treated no differently than terrorists themselves, the willingness to use a “coalition of the willing” if the United Nations does not address threats, the doctrine of preemptive war, and the president’s second-term “freedom agenda”.” Gibson asked this question just to try to intimidate her. regardless of whether she was unsure of what definition gibson was using, if she did indeed know about the doctrine and its various aspects, she would’ve displayed her knowledge by responding with something such as “as I understand the bush doctrine, in how blah blah blah, my thoughts are that blah blah blah blah”. If she doesn’t know it, she doesn’t know it. It is what it is. Quit trying to defend Palin. Shes an idiot! I can see Russia from my home but I can see them SLAUGHTERING a turkey 5′ behind my head!!! Thanks, very interesting. I was born in Thailand in 1960s but my parents fled and came here in England. To be honest, I didnt really care much about my Thai heritage until my mum died last month, now I’ve been trying to find out as much as I can. Seemed like food was as good a place as any to start from! Anyway, I found a thai food recipe site here that other readers might be interested in . A person necessarily help to make severely posts I would state. That is the very first time I frequented your website page and to this point? I surprised with the analysis you made to create this actual publish amazing. Excellent job! Actually one solution, that we beats by dre studio use personally beats studio ferrari would be to ensure that you Beats By Dre shop use bee pollen capsules. Nice post. I understand some thing much harder on different blogs everyday. It will always be stimulating to study content from other writers and practice a particular thing from their site. I’d would rather apply certain with all the content on my own weblog whether or not you don’t mind. Natually I’ll give out you a link in your web blog. Many thanks sharing. Might have also been much more thrilling to know the teaser attach with the powerplant as compared to that snapshot. Write much more, thats all I have to say. Literally, it seems as though you relied on the video to make your point. You certainly know what youre talking about, why throw away your intelligence on just posting videos to your web site when you could be giving us something enlightening to read?